With all the stresses of planning a wedding, it is important to enjoy some celebratory fun to release the pre-matrimony tension. The rehearsal dinner offers the perfect opportunity to connect with your family and friends as you prepare for the big day. The main purpose of a rehearsal dinner is to practice or rehearse the events that will occur at the wedding. It provides both the couple and those participating in the ceremony the opportunity to familiarize themselves with the location and the duties they will performing. It also allows for the two families to connect if they haven’t already done so. While the rehearsal dinner lends itself as the perfect time to cover any last-minute details before the nuptials, it also offers the bride and groom, as well as their loved ones, the opportunity to relax and enjoy the moment. Leave the planning to the hosts – Commonly the rehearsal dinner is hosted by the groom’s parents. Sometimes the couple may choose to take on these duties or the two sets of parents may split the rehearsal dinner responsibility. While a couple may offer input into the details of the dinner, it is best to ultimately allow the decision-making to be done by the host. Both formal and informal is ok – As a precursor to the big event, it is perfectly appropriate to have a less formal rehearsal. In fact, you don’t want its festivities to outshine the wedding itself. A casual BBQ or picnic can allow for a more relaxed atmosphere. 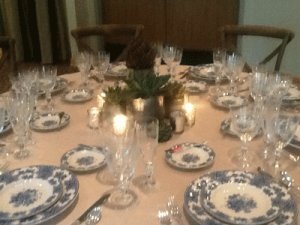 Consider the timing – While traditionally the rehearsal dinner is held the night before the wedding, it doesn’t have to be. If you are pressed for time or prefer a buffer in between, this event can also be scheduled for a couple days before the event. Savor the moment – Yes, there is always lots to do right before the wedding. But there are also lots of cherished moments that can be enjoyed. Take time at your rehearsal dinner to sit back, relax, and enjoy your loved ones. It can also create the perfect opportunity to thank them for all their assistance in both planning your big day as well as their continued support and love. One of the best ways to keep your rehearsal dinner more fun and less stressful is by hiring a professional to help you and your bridal party stay on task. An experienced event planner such as the staff at Windermere can assist in executing a wonderful event so you can enjoy the time with your loved ones. Contact us to learn more about our comprehensive wedding services.